Salutations my treasure hunting friends! How’s things? I’m checking in today with a few shabby vintage goodies from my road trip last week. A couple of my dearest friends and I went on a road trip to Glen Allen, VA to visit an antique shop we’ve been hoping to get to for a while now. Life just gets so busy you know, but we finally made it. 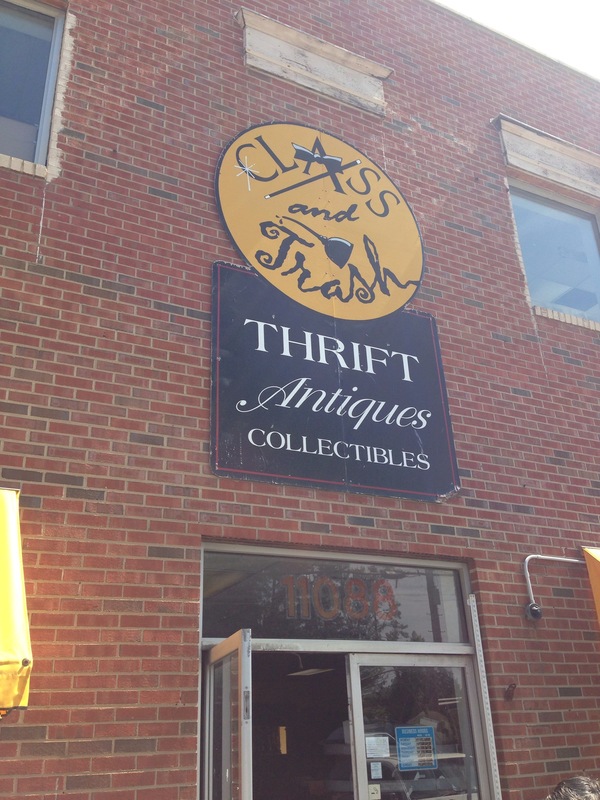 Holy cow — we hit the mother-load of treasure, this junk store is awesome and the plethora of furniture, signs, dishes, and bits and bobs are all very reasonably priced. So we searched and dug, we squeezed into every tight nook and managed to shift ourselves into every cluttered corner searching for vintage treasures at Class and Trash. If you don’t mind a little sweat (there’s no AC people! ), and a bit of rummaging, I doubt you’ll be able to leave empty handed. I had a hard time deciding what to bring home and I find myself daydreaming about a trinket or two that I wish I hadn’t left behind! 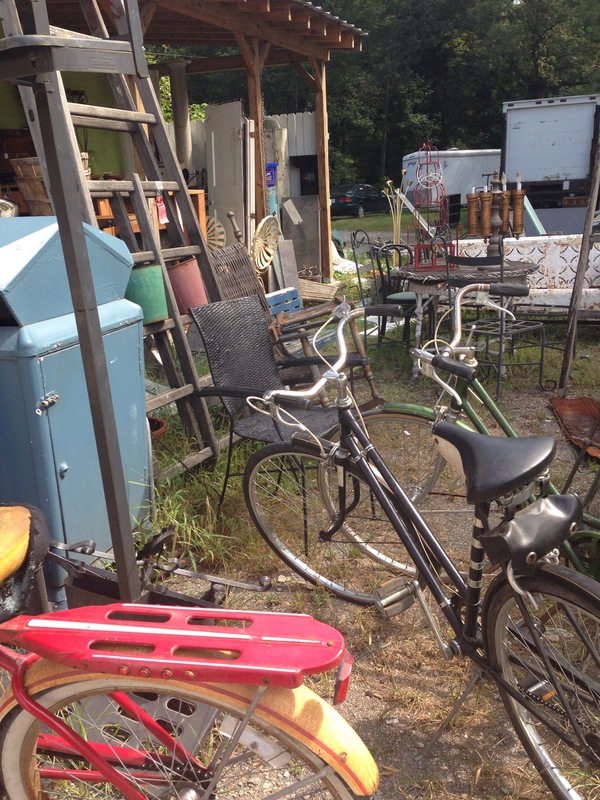 We were greeted by rows of vintage bicycles and a cornucopia of outdoor furniture and garden goodness. And once we were inside, it only got better! We had the best day of chatting and shopping and then lunch at Homeades by Suzanne in Ashland. This quaint little restaurant makes the best tomato pie I’ve ever had. I can’t stop thinking about it, piled high with Hanover tomato, basil, and cheese all in a buttery flaky crust. It’s going on my list of things to make — I’ve been dreaming about that pie. 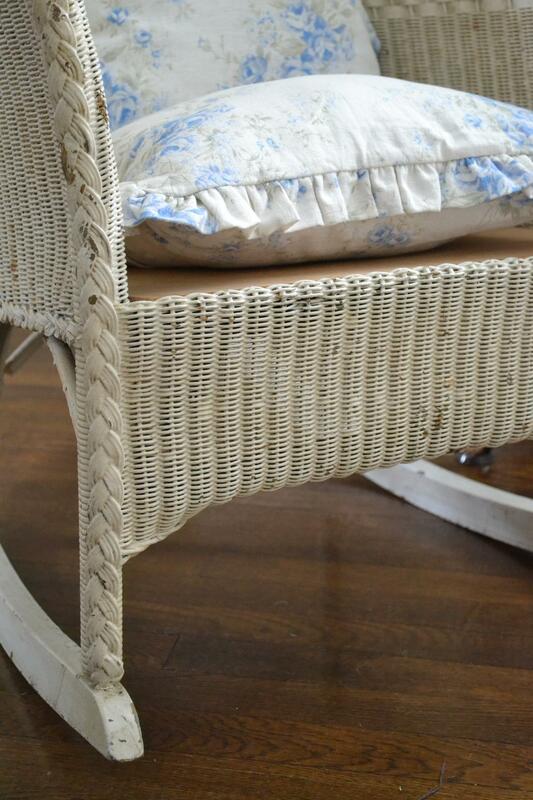 A vintage rocker in need of a cushion, but with a lovely chippy patina after a thorough scrub down. I’m hoping it will be easy to find a seat cushion that will fit without having to make one. A blue enamel bucket which also required a some major elbow grease. I was going to do something more fall like with this bucket, maybe with pine cones and fall colored flowers. But I’ll save that for next time since the pinecones are all wet and I have no fall-ish flowers. We’ve just had the most torrential rain in the past few days that I can remember. 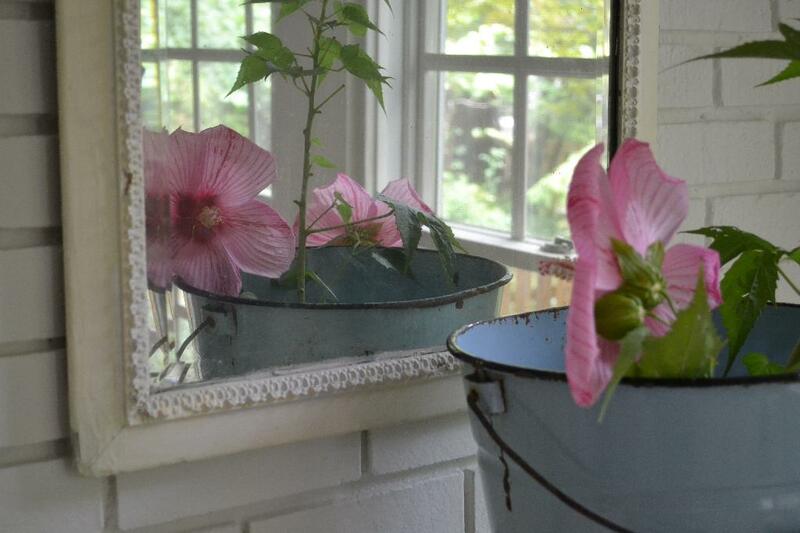 The back garden is a lake and roadways are closed all over town, but apparently these pink hibiscus are loving it! 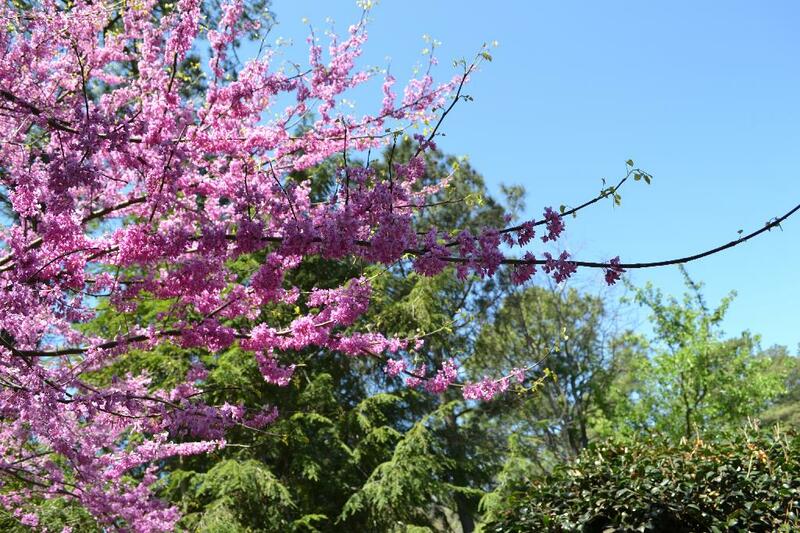 They are blooming like crazy here with the big rain at summer’s end. I found out last time I picked these that they only last a day or so inside. But there are so many I couldn’t resist! 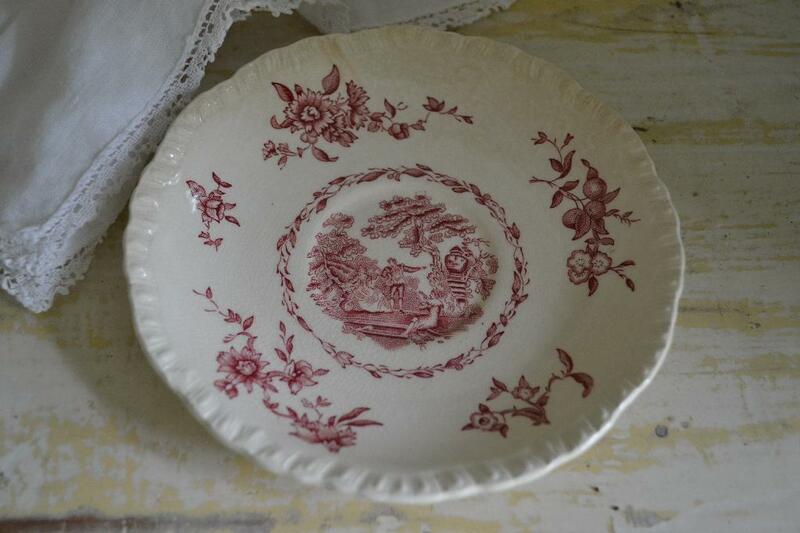 And I found a sweet little ironstone plate. The family pointed out that I already have this plate. I quickly corrected them — “this one is slightly different.” But it really doesn’t matter. It would have come home with me either way! This entry was posted in thrifty treasures and tagged accessories, furniture, shabby chic, vintage on September 10, 2014 by sally. I love all of your new finds! 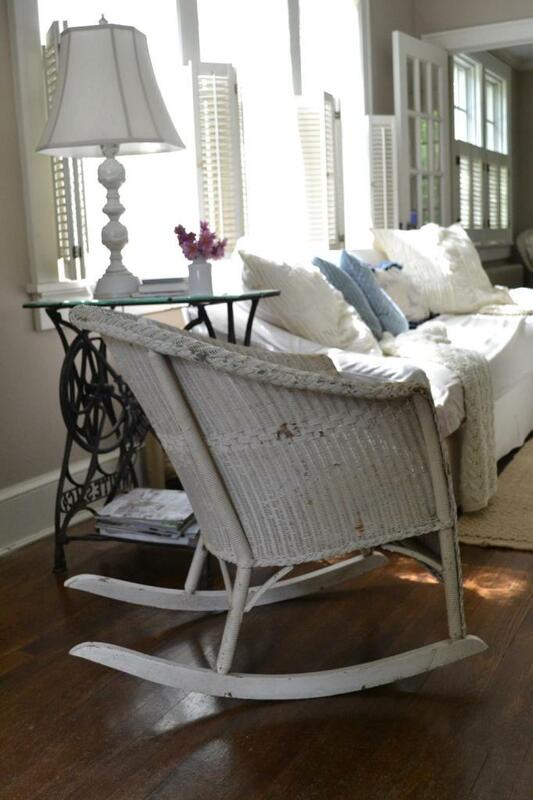 I bet you could find a cushion for that rocker at Pier 1 and then cover it in a different fabric if needed. I have some in off-white on my front porch rockers. 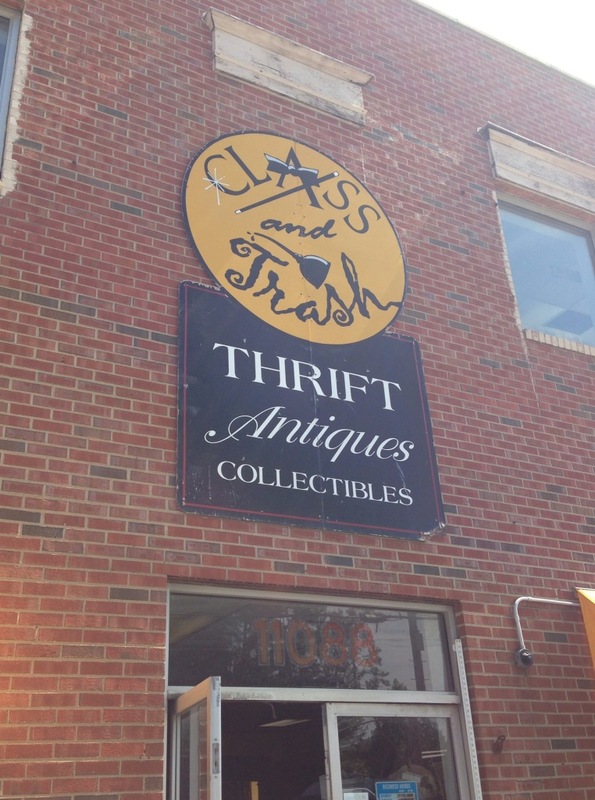 I’ve been to Class and Trash several times…definitely a fun place to treasure hunt. Love what you came home with. 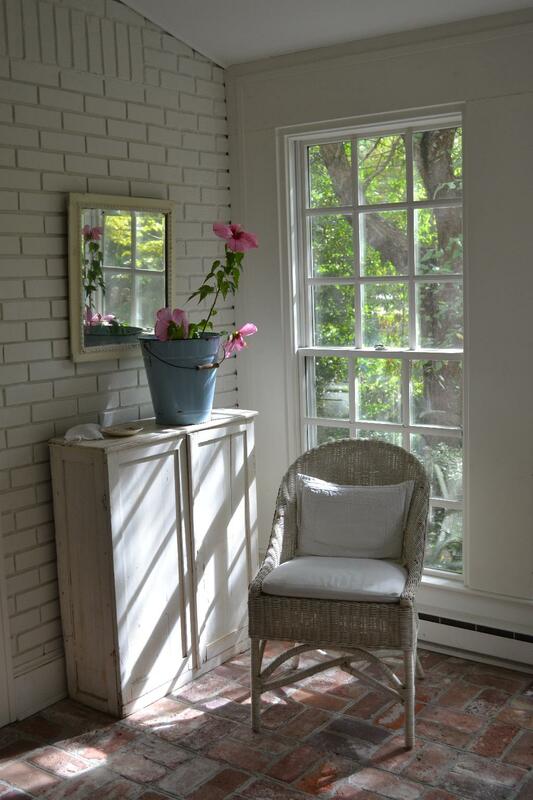 The rocker looks right at home, and that blue enamel bucket is wonderful!! The blue with the pink hibiscus surrounded by all white…Yummy!!!! Great finds Sally! Isn’t it fun to treasure hunt and come home with precious treasures from years long past? I love your house and it’s peaceful look. I have to believe that we are kindered spirits !!! I adore your wicker rocker and a cushion shouldn’t be too hard to find with all the end of summer sales going on now. Oh, and that blue bucket is to die for!!!!!! I envision you using this in your decor year round. What can I say about the iron stone plate ? It’s gorgeous and will be beautiful with all of your other iron stone you have on display. Yes, you did hit the “mother load” and I am so jealous, but so happy for you. Great finds! 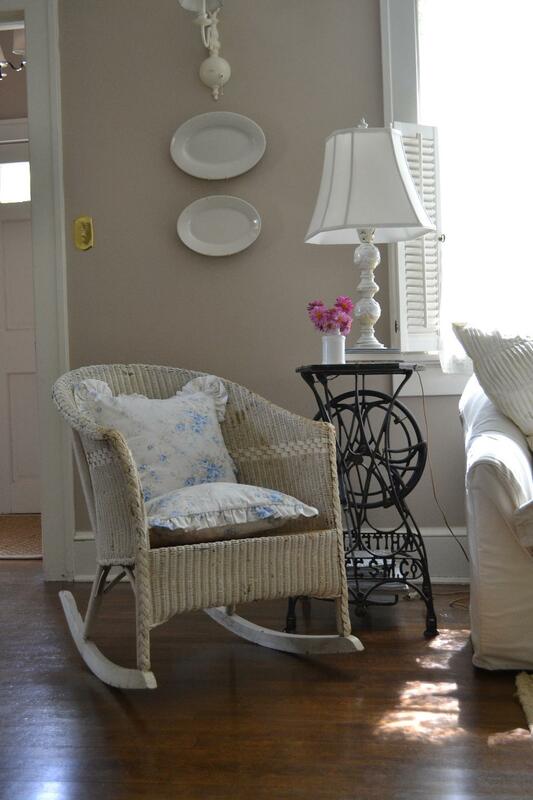 My mom actually has a weathered rocker just like that and she wants me to take it. I love the cushion you have on there now. The fabric is so sweet!